The Golden Age of Radio (sometimes referred to as old–time radio) was a period of radio programming in the United States lasting from the proliferation of radio broadcasting in the early 1920s until television's replacement of radio as the primary home entertainment medium in the 1950s. During this period, when radio was dominant and filled with a variety of formats and genres, people all across America regularly tuned in to their favorite radio programs. By the late 1930s, radio was woven into the fabric of American life. Public events, from political rallies to sporting events and vaudeville routines, were now enjoyed by millions in private. And, increasingly, Americans got their news from radio, especially news of the expanding war in Europe. The immediacy and drama of the war news tied people more intimately to unfolding events; it also, apparently, put some on edge. When Orson Welles broadcast his “War of the Worlds” on Halloween, 1938, he had no inkling that the mock terror of the play would resonate with a real terror of invasion among some listeners, prompting them to clog highways as they sought to flee the Martians. World War II also catapulted broadcast journalism into a powerful, and often superior, competitor to the newspaper. Edward R. Murrow, whose wartime broadcasts from London established a new level of eloquence and courage in radio newscasting, literally brought the war into people's living rooms. Radio has often been called "The Theater of the Mind" because of it's total reliance on sound as the transmissive medium. Listeners had to rely on voices, music, and sound effects to help them create a picture in their heads. In fact, radio news reporters often referred to what they did as painting a "word picture." In the pieces featured below, notice how difficult it is at first to discern different voices and sounds. In the Golden Age of Radio, listeners had no such problem, much like you have no problem today sorting the clutter of messages contained in the variety of media you have available. It just takes practice. 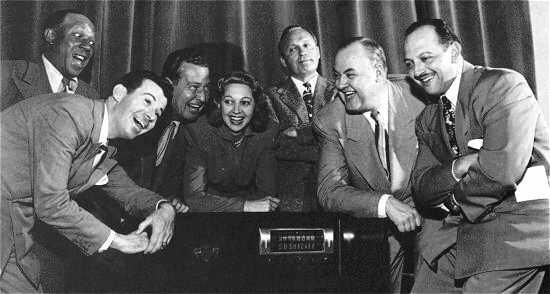 Cast of the Jack Benny Show. Jack is center in the back. Widely recognized as one of the leading American entertainers of the 20th century, Jack Benny was known for his comic timing and his ability to get laughs with either a pregnant pause or a single expression, such as his signature exasperated "Well!" His radio and television programs, tremendously popular in the 1930s, 1940s and 1950s, were a foundational influence on the situation comedy. William "Bud" Abbott and Lou Costello (born Louis Francis Cristillo), were an American comedy duo whose work in vaudeville and on stage, radio, film and television made them the most popular comedy team during the 1940s and early 1950s. Their patter routine "Who's on First?" is considered one of the greatest comedy routines of all time and set the framework for many of their best-known comedy bits. The Adventures of Sam Spade was a radio series based loosely on the private detective character Sam Spade, created by writer Dashiell Hammett for The Maltese Falcon. The show ran for 13 episodes on ABC in 1946, for 157 episodes on CBS in 1946-1949, and finally for 51 episodes on NBC in 1949-1951.